There are moments when you are working on your PC and you wished you could copy some text, links, photos etc to your Android mobile device easily without having to send it through email, Bluetooth or the hassles of transferring through a USB cable. Other option to transferring stuffs from our PC to mobile devices was the use of cloud storage services like Dropbox, Google Drive or the use of AirDroid. While some of these methods may be good enough for some files it may not be for others, for example you can use cloud storage services like Dropbox and Google Drive for files, photos music and videos, Evernote for list, notes and links. But if you need a way to send all file types be it links, texts, notes, photos, audio & video etc on one platform then PushBullet is the best choice. 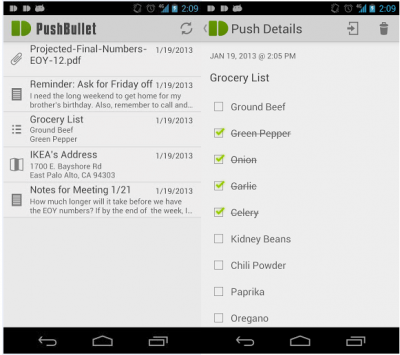 PushBullet lets you push files, links, photos, audio, video, texts from your PC to your Android device or vice versa. It could be that you are working on multiple devices at the same time and will so love to swap between your desktop and tablet or mobile phones or transfer files from one platform to the other, and you want to do it seamlessly. The first step is to download and install the PushBullet extensions on your browser and the PushBullet app on your Android device(s). 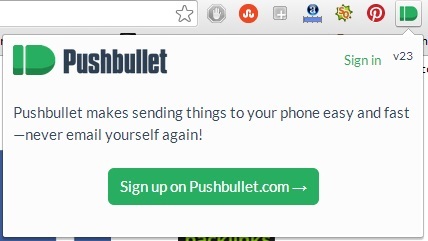 Then click on the PushBullet icon placed on your browser and click the “Sign Up” button. You will be redirected to the PushBullet website where you will be required to sign up with your Google account. 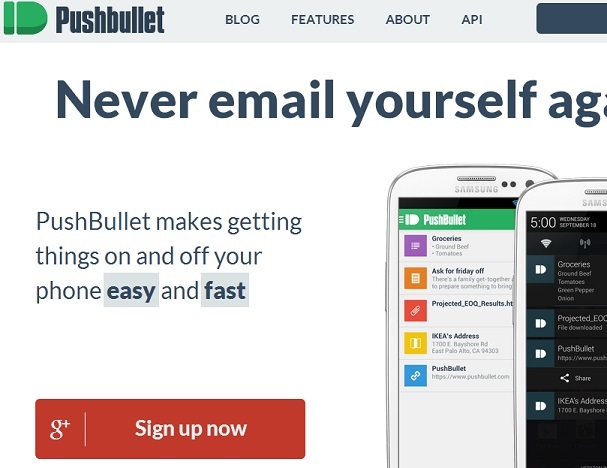 Grant permission to the PushBullet app and your account will quickly be set up. Next install the PushBullet Android app on your Android device(s) and sign in with same Google account you used earlier so you device(s) will be recognized. You can see all your linked devices when you login to your PushBullet account. The interface is quite simple and easy-to-use. It is not difficult to figure out how you can start using it. There are just 5 options to choose from – Notes, Address, List, File and Link. Simply select the device you want to push to and select the type of content you wish to transfer be it Link, Note, Address, List or File. The different tabs have their different layout and all you need it fill it up with the content you want to push and click the Push It button. Once you push any content you will almost immediately get a notification on the listed device you pushed to that a file has been received, you can open it to see the pushed content. 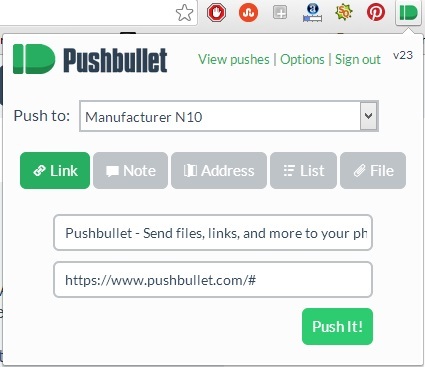 Try PushBullet today and you will find it very interesting and useful I use PushBullet to transfer contents between my devices and it is so easy you will definitely enjoy using it. Try it today and tell me via the comments what you think of it and how you think the app can be improved. Remember to subscribe to my blog. That’s such a useful tool! I mean, setting it up is easy, since I use Chrome browser, I’ll go for the chrome extension and install the app on my android phone. I guess it will work like a charm! It’ll definitely make things easier than before. I have used cloud services and Airdroid, but they take their time while transferring large files. PushBullet is a good solution for sending links and other things, But I prefer in network solutions for large files. Yes you will definitely find this app very useful. Cloud storage are great but this PushBullet make things easier, this is so an helpful info, thks for sharing it. This is my first time of learning about PushBullet. It seems like a file transfer system one can use for multiple devices. I am going to download the app on my android and also download the extension for my browser to see how this really works out. In kingged.com, the content syndication and social bookmarketing website for Internet marketing,I have left the above comment where this post was shared. I found this post shared on Kingged.com, the Internet marketing social site, and I “kingged” it and left this comment.